It’s 11:30 at night, and I should be in bed, but I wanted to make a Valentine’s card that my students could decorate and use for tomorrow. If you’re teaching Spanish tomorrow, click the picture and download the card for a quick writing activity. 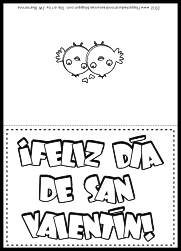 ¡Feliz Día de San Valentín! Thank you so much for creating a resource in Spanish! It's like looking for a needle in a haystack for my Spanish-immersion preschool, Spanish Splash Preschool (www.spanishsplash.com).